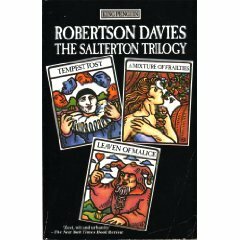 The Salterton Trilogy: Tempest-Tost, Leaven of Malice, A Mixture of Frailties, Robertson Davies, Penguin, 1986, 775pp. This is Davies first trilogy, and, if I remember correct, his first novel was the lead-off to this, Tempest-Tost. Before writing novels, however, Davies had written several plays, so his first novel is quite accomplished. The Salterton trilogy is almost misnamed–yes, it does center around the town of Salterton, but the real center of the three books is Solomon Bridgetower. Although he is almost a minor character in the first book, he and his family are front stage in books two and three. Tempest-Tost is about an amateur production of Shakespeare’s The Tempest. The Salterton players assume they can have the use of the garden of their most famous citizen, and it is this assumption of community use that leads them into trouble. While no characters in the book undergo a sea-change, several characters do awaken from passive slumber to new lives, sometimes with mixed results. For anyone who has ever been involved in amateur theater, this is an extremely amusing tale. Others might find it belabored. Not so with the second novel, which is about class and prejudice, but told in a Wodehousian manner. Winner of the Stephen Leacock Memorial Medal for Humour (a Canadian award for best humor novel–I wish I could find a list of past award winners), Leaven of Malice concerns an engagement announcement in the local paper that was placed by neither bride nor groom. The resulting conflict between the two families brings up old academic rivalry, the worst of the new goody-two-shoe couple in town, and an escalation of lawyers. In some ways it is a mystery, too, as the two “lovers” attempt to find who had the malice to link their names in the public eye. The concluding volume, A Mixture of Frailties, is about a trust established by Solomon’s mother, and how it must be awarded to a specific individual. But finding the individual is only the start of Solomon’s trouble, and the story follows two separate lines: one regarding Solomon and his need for a heir to rid himself of his mother’s legacy, and one regarding the lucky trust recipient, and her entry into the world of opera. There were certain things near to Davies’ experience, it seems: theater, academic life, and trusts. Trusts can be found in both A Mixture of Frailties and the second and third books of the Cornish trilogy, academic life is featured in Leaven of Malice and The Rebel Angels, and theater productions in Tempest-Tost and The Lyre of Orpheus. I can easily see myself rereading Davies in ten years, and rediscovering all of this once again. Next: Sandman: Fables and Recollections, Neil Gaiman et al.